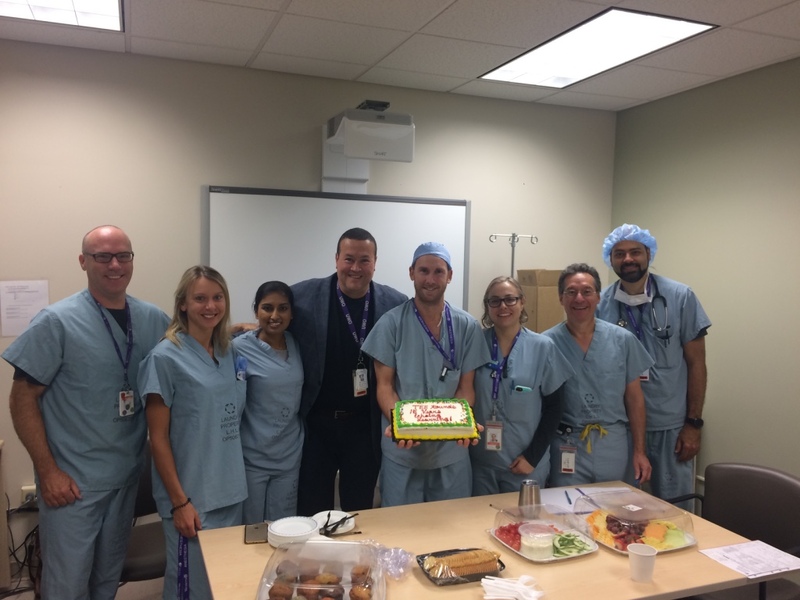 Our Department proudly celebrates the 15th Anniversary of Fellow TEE Rounds. This educational activity was started by Drs. Ivan Iglesias and Daniel Bainbridge and was aimed initially to offer an "in house" training opportunity for Cardiac Anesthesia Consultants willing to challenge the NBE Perioperative Transesophageal Echocardiography Exam. From there it evolved into an interactive educational activity planned to cover the complete NBE Syllabus and offer Cardiac Anesthesia Fellows a patient based approach to learn both cardiac anesthesia and intraoperative echocardiography. Over the past 15 years the news of our TEE Rounds spread all over Ontario and to Montreal as other Academic Cardiac Programs began to copy this model and start their own TEE Rounds. Our Department was a leading example of a useful teaching initiative that has kept going strong and is highly valued by our Fellows. Our Fellow TEE Rounds take place Mondays, Tuesdays, and Fridays at 7:00 am and are currently broadcasted through WebEx thanks to the work done by Dr. Ramiro Arellano. The Cardiac Team held a special TEE Rounds to celebrate 15 years. From left to right: Drs. 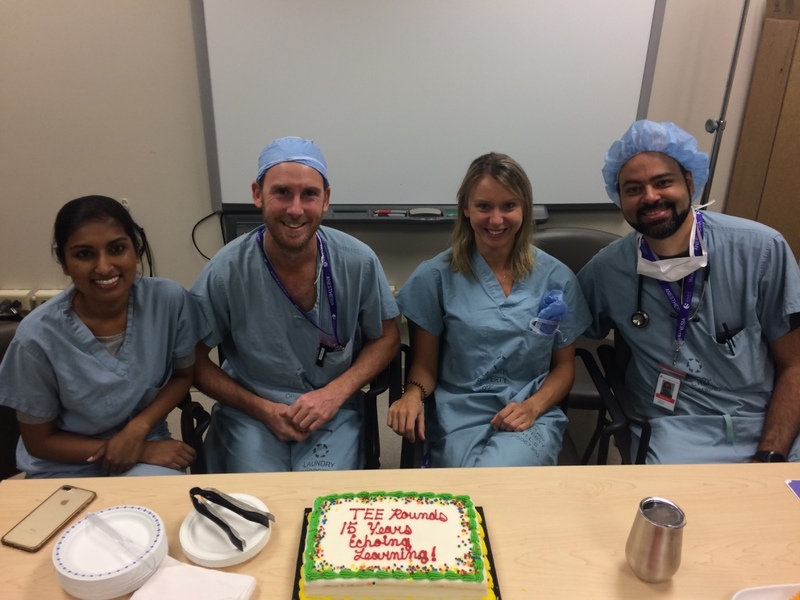 Ranjana Bairagi, Murray Campbell, Mathilde St-Pierre, and Raffael Zamper are our current Cardiac fellows. 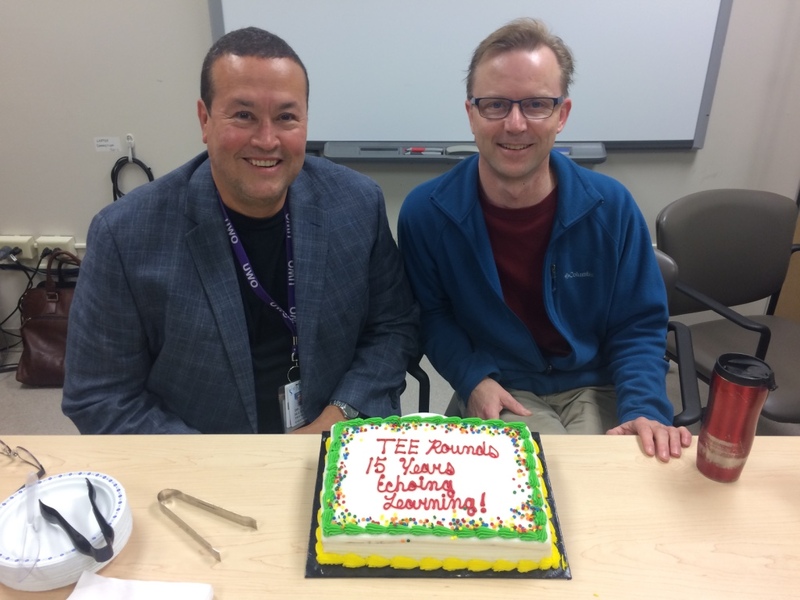 Dr. Ivan Iglesias and Dr. Daniel Bainbridge co-created TEE Rounds 15 years ago.